Chords – Live at Stockholms Kulturfestival! I’m a very big fan of Chords but I’ve only managed to see him live 2 times in 5 years, well I’ve seen him as “Helt Off” and of course together with Timbuktu but solo concerts by Chords is still a pretty rare thing. So when i found out that he was doing 2 gigs in Stockholm (one on my first and only day off in 2 weeks!) I was psyched! I went to both gigs, the first was at “Club Spiderdogs” but I’ll not go into details about that concert since it was nothing in comparison to the gig he did the day after (it also might have to do with the fact that I was a bit drunk during the first gig). The show kick-starts with Moe and Spider Dogs gradually building up the beat to “Night Time Comes” and by the time Chords enters the stage the crowd is already wild! Spider dogs really does an amazing job and it really ads a lot of extra energy to the show. Wrap your chops is really something extra when you see it with a live band and when the whole crowd is screaming “high, high, high” during the chorus and Spider Dogs stats playing the beat to Luniz classic track “I Got 5 On It” I find it hard to imagine that the show will get any better than this. Wrong! This gig is full of guests and when he’s done with his verse and chorus from “on the grind” he suddenly starts to sing the chorus from “På din grinn” and Organism 12 jumps up on stage, followed by Öris and then Mofeta. We’ve been promised a secret guest and after Mofeta has left the stage the band starts to play “Det brinner i Paris” and Timbuktu runs out on stage, by now the crowd has gone ballistic! You can really see that these two guys has shared a stage hundreds of times, they could probably jump up on stage together without rehearsing and give one hell of a gig! The whole show was amazing and it makes one really wonder how anyone in the right mind can choose “Broder Daniel” before Chords. All I can say is that if you went to “The Voice 08″-show (why the hell would anyone do that!?) or just stayed home you really missed out on something! 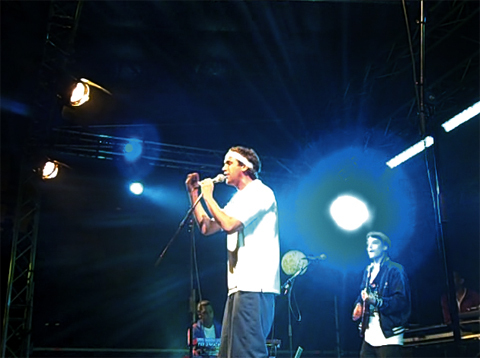 Big up to JuJu Records for the photo from the show! I can’t record video clips with my phone and I don’t have access to a camera so to really show you how good “Wrap Your Chops is with a live band I thought I would give you a clip from the gig at “Joe’s Pub” a couple of years ago, enjoy! This entry was posted in Nyheter, Recensioner and tagged Chords, Damn!, Joe's Pub, Live!, Moe, Mofeta & Jerre, Organism 12, Öris, Spiderdogs, Stockholms Kulturfestival, Timbuktu on August 23, 2008 by Daniel.